The BabyBjorn Baby Cup is the perfect first cup when your child wants to learn how to drink from an open glass, just like mom and dad. It’s ergonomically designed for tiny hands with a strong will. The cup feels nice to hold, stands firmly on the table and is hard to knock over. It’s color and shape match the BabyBjorn Baby Plate and Spoon. Suitable for ages 8 months old and up. My 18 month old is able to drink by herself using these cups. They don't fall over or spill as easily as regular cups. She always wants a cup because her older sister has one, so these are perfect. 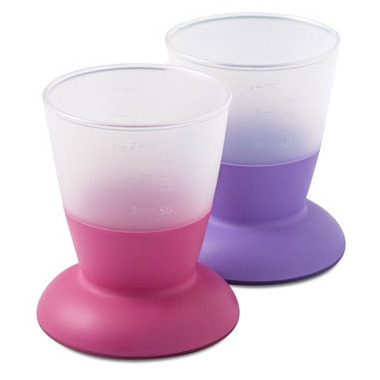 These cups are perfect for little hands and with the base adjusting the centre of gravity it makes those accidents less likely. The cup will wobble and not tip! We use this cup for water and sometimes for food, the spoons fit it so perfectly. Must have for every mama!